Apple today announced the Watch Series 3, which the company will offer in both 4G LTE and non-LTE versions. 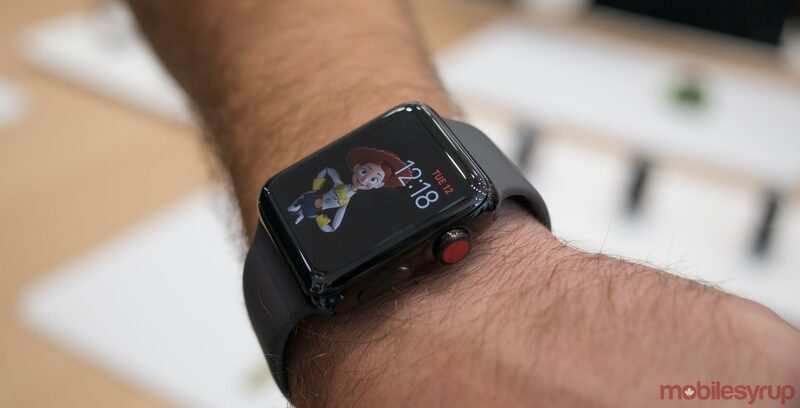 The Apple Watch Series 3 with cellular connectivity will be available at Bell and Telus, though Bell is only carrier to have its system prepped for a September 15th pre-order date. The carrier says the watches will hit shelves beginning September 22nd. While Telus and Bell were the only two carriers to officially confirm stocking the LTE Apple Watch Series 3, more carriers may join as systems for the service are put in place. Rogers, however, has informed us that it will not carry the Watch Series 3 for the time being, nor will its sub-brand Fido. The LTE-capable Apple Watch Series, available in gold, silver and space grey aluminum or silver and space black stainless steel, will start at $519, while the non-LTE version will cost $429. Check out the details on what each carrier is offering below. This article will be updated as and when we receive more information. Bell: The carrier is offering a $5 Smartwatch plan that lets users share data and a phone number with their Canada-wide/Canada-U.S. Share plan through a feature dubbed ‘NumberShare.’ It’s also providing a limited-time promotion that gives users the first three months of the plan free. Telus: The company has added pre-registration to its website, allowing customers to sign up for a notification when pre-order is available. Let us know what you think of the new LTE watches below! Update 12/09/17: Updated with comment from Rogers. Update 14/09/17: Article updated with further detail about required smartphone plan at Bell.